Ari Marcopoulos, 31000001, 2015, color photograph, 8 x 10". Underlying a new body of work by the New York–based artist Ari Marcopoulos is a wintry restraint that adds new depth to his more than forty-year career as a documentarian of subculture. His upcoming exhibition at Marlborough Chelsea, “L1032015,” is as much about the everyday compulsion to make images as it is about the currents of art history that steer it. The show is on view from April 4 through May 9, 2015. CERTAIN THINGS INVITE YOU TO TAKE THEIR PHOTOGRAPH. They trigger an emotion or chemical in your brain that compels you to make an image. I wanted to get away from that, to work more automatically, and I did it in a few ways; I began printing images multiple times on top of one another to create black rectangles. I also started photographing things that were abstract or that became abstract the more I photographed them. For example, I would photograph undercover cop cars every time I saw them—Crown Victorias and Chevy Impalas from the side with no low or high angles, no interpretation. As I take the photo over and over again, the car loses its significance. It becomes a repetition. The single silver gelatin print of an Impala in my exhibition may talk about authority or misuse of authority, but it is also just a shape, an outline. Most of the time my photographs are flat and boring. The title of this show—and of most of the works in it—is based on a number that refers to either my archiving system or the number that the digital camera assigned to the photograph. I’ve made a lot of books and exhibitions and I think about titles a lot. For this show, I’m offering less of a poetic exchange through the titles. Of course, the image of my brother, I felt, could only have the title of his name because I didn’t want to give him a number; that’s emotional matter. The photograph is from 1992 and it emphasizes some of the abstract aspects of the show. In the installation, he’s paired with a large gray rectangle that has a date stamp from the particular camera that I use. The date stamp is basically the only clue that it is a photograph; I made it as big as I could, but the printing machine dictates its size. It’s just a gray rectangle, whatever that means to you. When you work with photography as a medium for a long period of time, you think about it every day; it’s always there. I am mostly occupied with images I make in the moment, and the images in this show were all taken within a few days of one another, with a few exceptions that still reflect present concerns. In the end, the show is about being in the world now and knowing what it was like to be in the world a decade before that, and a decade before that. I visited the On Kawara show at the Guggenheim and I remembered many of the events that were in the newspapers on view—not just the moon landing and Patty Hearst, but also buildings bombed, permanent war, and fear of terrorism, which have all returned now, or rather, remained the same. In this show there is a work that refers specifically to my past. 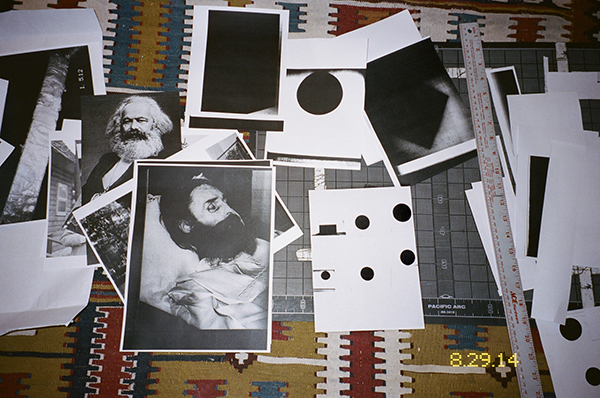 It’s a photograph of my studio floor as I was working on a zine, and it almost looks like a collage. All of the elements relate to my memory, to how I was educated with a socialist touch in a Dutch school. There’s a picture of Karl Marx, abstractions that refer to art history and work I saw at the Stedelijk as a teenager, and there’s a Baader-Meinhof reference. I wanted to talk about being in the studio, thinking, reading, working, and the time that takes. The composition could also be read as a reference to Bruce Nauman, even though that’s aiming quite high, but it could be aiming quite low. The image is about elevating the commonplace. It also relates to the video in the exhibition, which I shot out of my studio window. Proximity is very important to me. It took me eight months to finally decide to film, but it’s only fifty seconds long. It’s very simple, but nothing comes easily. Everything is a process of thought and doubt.